Ages 5 through 11. 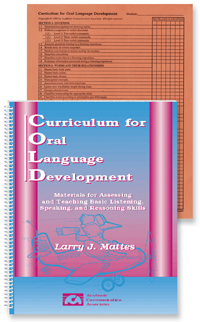 This kit includes criterion-referenced assessment measures and instructional activities for teaching listening skills, thinking strategies, vocabulary, grammar, and basic pragmatic communication skills. Skills emphasized include answering questions, associating nouns with their functions, classifying nouns, expressing needs and feelings, using vocabulary effectively, describing actions, describing characteristics of objects, describing experiences, solving problems, describing a process, expressing viewpoints, sequencing stories, predicting conclusions, and other skills. Part 1 includes informal measures for assessing children's performance in a variety of listening, speaking, and verbal reasoning skills. Part 2 includes activities that can be used to teach the skills assessed in Part 1. The complete kit includes the manual and 30 record forms. A CD that includes the entire book in a PDF format is available as an optional item. The CD makes it easy to print out copies of the reproducible book pages.